I have a confession to make. I’m a fan of the original 1987 film Predator starring Arnold Schwarzenegger, Carl Weathers, Bill Duke, and a ton of other fun tough guys. No, it’s not even close to the best movie ever made, or even the best Schwarzenegger film, but like I said, it’s a lot of fun, relative to 1980s action, blood and guts movies. I’ve seen it dozens of times. I’ve seen all of the other Predator sequels including the various “Aliens vs. Predators” movies exactly once. They aren’t as much fun, but still a way to kill a couple of hours. Like the original, it starts out in a jungle environment (that is, after the whole “chase through space” sequence), but that’s not where the main action takes place. Also, this movie is really a sequel to all of the others (not sure why they didn’t mention Aliens) and naturally, after a spaceship crash, a secret U.S. government project called “Stargazer” captures the pilot and calls in evolutionary biologist Casey Bracket (Olivia Munn) as a consultant. 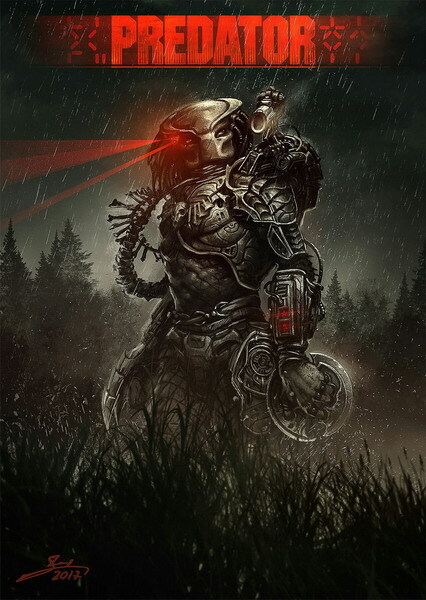 Of course, all hell breaks loose and the Predator escapes. When trying to influence someone and you find that your first approach is not effective, try to figure out what specifically is holding him back from accepting your position. For example: What fears might he have? What obstacles might he be focusing on that would make it difficult for him? Then show the person why he has no reason to be afraid and that the potential obstacles will not be a problem. Today, think about what fears are holding you back from taking some positive action that you know is in your best interest. Imagine that you have been given the gift of tremendous courage and confidence. Let this empower you – and resolve to take action! When you are not yet ready to take action, visualize yourself taking the action that you would really like to do. This way even though you are not in a frame of mind to actually take the specific action, you are mentally preparing yourself. Your mental pictures will make it easier for you to take action. When you run pictures of yourself doing the things that you want to do, this mental rehearsal will shorten the amount of time it takes to build up your willingness to act. Mentally picturing yourself taking action will help you overcome the resistance you are feeling. Anything we’ve successfully done in real life makes it more likely that we will take that action again. Anything that we’ve visualized doing is stored in our brain as if we actually took that action. We all have experienced zrizus and moments of joyful willpower. That is, we did things swiftly and right away. There are many instances when we felt motivated to do something positive that we strongly wanted to do and felt good about actually doing them. When you recall a moment of zrizus and joyful willpower, you can experience in the present how you felt then, and recall what actions this led you to do. See what you saw when you felt the feelings of zrizus and joyful willpower. Hear what you heard when you felt the feelings of zrizus and joyful willpower. Feel what you felt when you felt the feelings of zrizus and joyful willpower. When you explicitly write that it is a “to do with joy” list, you are giving yourself a valuable message: You are telling your mind to remember to be joyful. A person might feel rushed to do all the things on the “to do” list. A person might feel a little resentful or overwhelmed that he or she has so many things to do. But when you call your list a “to do with joy list,” you are preparing yourself to feel good while you do the things that you want to do. This is so important and valuable that it’s worth repeating. “If you are doing it anyway, you might as well do it with joy.” We are constantly choosing our thoughts, our feelings, our words, and our actions. You can choose to feel distressed or joyful about taking care of the things that you need to take care of. When you take action with zrizus, choose joyful zrizus. Some people become overwhelmed when they feel they have too many things to do and they don’t have enough time to do them. This overwhelmed feeling causes them to move more slowly than they usually do. Their minds becomes unclear. It’s hard for them to focus and concentrate. Instead of becoming more efficient at what they have to do, they act way below their standard competency level. What is the solution? Serene zrizus! What does it mean to have serene zrizus? It means that you take action, and you do so with full speed ahead while remaining calm and tranquil inside. You move as fast as is appropriate for the specific situation and circumstance. But you have peace of mind. You might not have previously associated zrizus with serenity, but now you can. Your mindset acknowledges that you will do everything that you have to do and that you will have an inner calm. Although you might move quickly, inwardly you are at ease. A key benefit of having serene zrizus is that you think clearly. You think about what you need to do, and you remain calm as you take action. Action will enable you to accomplish and achieve. But something must come before taking action: thinking. Think first. Yes, think big and think bigger, but always think first. Taking action without thinking will lead to many avoidable mistakes and errors. Taking action without thinking first will lead to unnecessary quarrels and arguments, hurt feelings, and misunderstandings. Taking action without thinking will lead to wasting much time and energy. Taking action without thinking might get you far, but it’s likely to get you far in the wrong direction. When you spend time thinking about your options and about consequences, you will be able to learn from each experience to think even better and wiser next time. Create the habit of taking action right away. To make anything a habit, you keep doing something many times. The wise person doesn’t wait until a new habit becomes a habit. He acts the way he would act if he already had the habit. And then automatically his actions become a habit. If you presently find it difficult to believe that you can become an action-oriented person, you will benefit greatly from a teacher, mentor, friend, or coach who believes in you and your abilities. Having someone you respect believe in you is inspiring and motivating. You will gain a stronger and deeper belief in yourself.